This topic is nothing new. But at the same time, I keep coming across translators who resist making the shift to a niche market or specialization. I understand. I did the same thing for a while when I first started out as a translator. You want to take just about anything that a client will send your way, because it helps your bottom line while you gain experience. Soon enough, though, you'll reach a point when the generalist translator life doesn't feel so pleasant. Why? Because many times, these general jobs are one-offs. Clients come to you, ask you to complete a task, you do, and then you never hear from them again. If you're lucky, you'll have a few clients who send semi-regular work in general areas, but none of these allow you to be really specialized in any one area or serve any one market really, really well. Then issue becomes, how do we know when to stop taking all of those general jobs and make the shift from generalist to niche? I have some thoughts on this, and I've broken them down into three questions to ask yourself. Question 1: Who is your ideal client? This may be the hardest question you'll have to ask yourself if you're still marking yourself as a generalist. That's why it's first on the list! If you don't know who your ideal client is, then how can you possibly market your services effectively to anyone? I recently had my T&I Website Blueprint Course students create Ideal Client Profiles before they even started to work on writing new web copy or designing their websites. Why is this vital to get right? Because, quite frankly, you need to know who you're talking to if you're going to market to them effectively. If you tell me that you don't need to know who your ideal client is to market your services well, then I would ask, "Then, who are you marketing to in the generalist market?" I would be willing to bet that the answer does not come all that easily. If you cannot clearly explain who you work with or the work you do, then you are probably trying to appeal to too large of an audience. And this can be both confusing to clients and even off-putting. After all, no one is truly a jack of all trades. When someone outside our industry asks you who your clients are, what do you tell them? Please don't say "Anyone who needs a translation in (insert your language pair)." PLEASE. When you say things like this, you make your job sound a) easy and b) like you are willing to take any job that is sent your way. This type of response, while maybe fine for you, doesn't exactly make the rest of your colleagues look very good. Successful professional translators spend years honing their craft in specific fields for a reason. For more on this topic, check out How to Determine and Attract Your Ideal Client and How to Create an Ideal Client Profile to Market Your T&I Services. Question 2: Do you want to raise your rates over time/in the future? If so, then you cannot continue to be a generalist forever. You could try, but can you imagine how wide the net you cast will have to be? 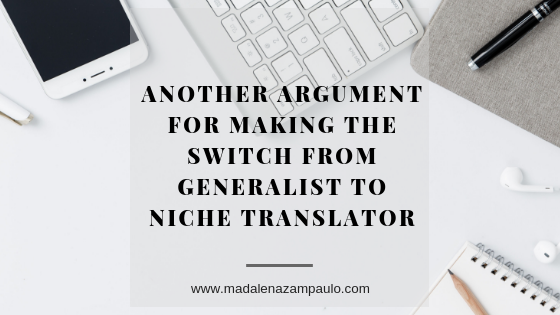 If you narrow down your niche, you can focus on a market that pays well and that needs solid translators like you. In addition, you can market to clients who have repeat work. Let go of those one-off projects that come and go, leaving you in a feast or famine state. Sure, you can tell me, "But I like the general projects, and I get them frequently." Well, yes, we all get these requests. And they're fine "filler" projects for the times that we aren't busy, but I would argue that they aren't exactly sustainable for the long term. You simply cannot project where a general market will go. But with a niche market, you have a better chance of watching market trends and making long-term projections. Take my specialization, for example. I am a medical and life sciences translator. I love my niche, and not just because of the subject matter. I also really like knowing that clinical trials last for years (years! ), so I will undoubtedly have ongoing work for at least a year when I take on a new client that is a Clinical Research Organization (CRO) or whose client is one. This kind of peace of mind is very valuable to me. I have worked on some trials for a minimum of three years for the same drug. This is the kind of work that allows me to be very specialized and to learn subject matter well so that I can translate at a faster rate. For more thoughts about rates and pricing, check out How to Stop Competing on Price As a Translator or Interpreter. Question 3: If you constantly take on general work, how can you improve in any one area? Remember what I tell my blog readers and students all the time: When you try to please everyone, you end up pleasing no one. Don't try to take on all the projects. Be selective, and keep an open mindset. More projects will come your way in that niche area if you take the time to nurture your client relationships! For more ideas on ways to nurture client relationships, check out More is Not Better When it Comes to Your T&I Client List. I’ll leave you with an example from one of my T&I Website Blueprint Course students. She started the course with a very firm belief that she was a generalist. And by the time she finished working on her Ideal Client Profiles (she has two types), she realized, "Wait! I have two solid specializations, and they are both in high demand!" YES. Now, when she markets her services, she knows exactly who she's talking to and how to appeal to them. Take the time to discover your niche areas, give them some attention and fight the urge to take on every project that is sent your way. Even within your niche area, you may find that there are certain in-demand projects you aren't willing to take on. Here's an example from my own work. I don't take on projects from my medical and life sciences clients that contain large amounts of handwritten text. I can't stand these projects. I am so slow at translating them. And I simply cannot read some of the handwriting well unless it's pretty close to flawless. If you've ever seen a doctor's handwriting, you know that this is often not the case! So, even though I know I can charge more for these types of jobs, I turn them down. Why? Because I don't need to please everyone. I can be selective, and it's proven to be very beneficial to me. I refer a colleague who handles these jobs well, and I can take on more of the work I'm good at and work at a relatively fast pace. The efficiency in my work alone is a testament to earning better money by working this way. Okay, now you tell me… what are your thoughts on remaining a generalist vs. niching down?